Well, apparently I'm the first one who has encountered this because there is absolutely no reference to it anywhere I can find on the World Wide Web (no one uses that term anymore but it's technically more accurate than Internet here so I'm using it!) and whenever I encounter a situation like that, I like to write a blog post about it so that the next person who comes up against the issue can find at least 1 result when he/she searches. Perhaps no one will actually ever search for information on this issue because there is a sense in which how to deal with this issue is pretty obvious once you understand what the issue really is, but if you're seeing the error and missing the underlying issue, you will find this post helpful. 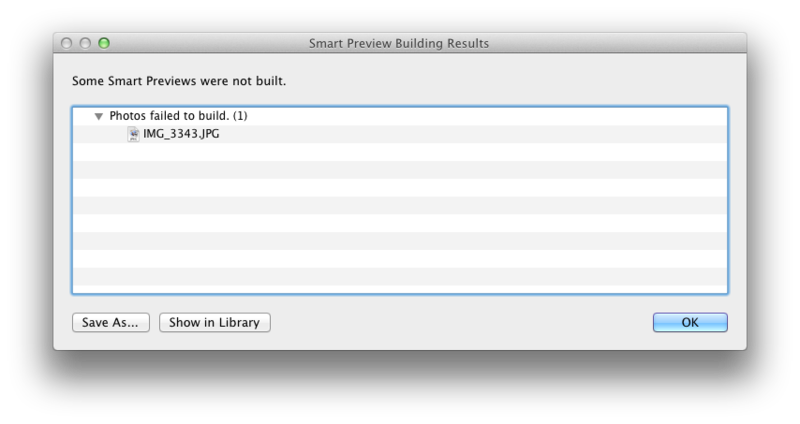 As you can see, it says "Some Smart Previews were not built" and then farther down it says "Photos failed to build" and it lists out one lone photo for which the Smart Preview was not built. Not shown but also present in Lightroom is a new entry under the Catalog listing on the left side (the place where you can find "All Photographs," "Quick Collection +," "Previous Import," etc.) that is titled "Photos That Failed to Build a Smart Preview." 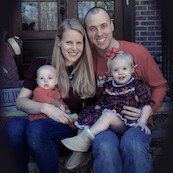 When I take a look at the offending photo in Grid View, I see that in the upper-right corner, it has an error indication icon and when I hover over that with my mouse, the tooltip message "Lightroom has encountered problems reading this photo" comes up; if I look at the photo in Loupe View, it has a banner across the top indicating "There was an error working with the photo"; given this, it is unsurprising that further attempts to build a Smart Preview for the image result in the same error dialog noted above. But knowing that the real issue here is that there is a problem with the image (it's a corrupt image I suppose) the course of action is clear: remove the photo from Lightroom and re-import it (of course this assumes you have another copy somewhere; hopefully you either directly kept the original or you had Lightroom save a backup for you or you backed up the photos yourself or something). The way I accomplished that was to remove the photo in Lightroom then copy the original version of the photo to the proper directory in Lightroom and then I right-clicked on the folder in the Folders section on the left side and chose "Synchronize Folder" and Lightroom found the photo and then I told it to import it--and the cool thing was that at the end of the import, Lightroom presented me with a dialog box indicating it had created a Smart Preview for the image so I instantly knew all was well! Keywords for search indexing: Lightroom Photos That Failed to Build a Smart Preview, Lightroom Some Smart Previews were not built, Lightroom Photos failed to build, Lightroom Smart Preview Error, Lightroom Smart Preview Build Error, Lightroom Smart Preview Building Error, Lightroom Smart Previews Error, Lightroom Smart Previews Build Error, Lightroom Smart Previews Building Error.